EU environment ministers have agreed in principle to cut greenhouse emissions by 20% from 1990 levels by 2020. The ministers, meeting in Brussels, also agreed to seek a 30% cut worldwide if matched by other developed nations. The proposals, outlined by the European Commission in January, are seen as a key measure to curb climate change. The EU must still decide how to make cuts, allowing for a possible compromise with member states opposed to mandatory targets. Hungary and Poland, who joined the EU in 2004, opposed making the cuts mandatory, diplomats said. Finland also reportedly voiced opposition to the commission's targets. But German Environment Minister Sigmar Gabriel said his country was prepared to go further and cut emissions by 40%. "There will be some countries like Germany that will see a steeper reduction in greenhouse gases," he said, quoted by the Associated Press news agency. On Sunday, environment ministers from the UK, Spain and Slovenia urged the 27-member block to endorse the 30% target. In an article for the BBC News website, they said that failure to act would threaten efforts to persuade nations such as the US and China to agree to cap emissions. In January, Environment Commissioner Stavros Dimas urged "the rest of the developed world to follow our lead, match our reductions and accelerate progress towards an international agreement on the global emission reductions". However, international negotiations on the shape of the framework to replace the current Kyoto Protocol, which expires in 2012, have struggled to reach a consensus. 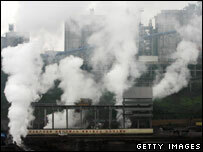 A number of nations have voiced doubts about the effectiveness of national emission limits.